Baptisia has long held importance as a dye for textiles. 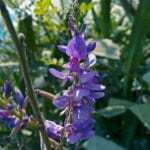 It is also called false or wild indigo. The plant is native to North America and with its deep blue blooms, provides a perfect enhancement in the native perennial garden. Baptisia is an easy to care for plant with moderate growth rate and no need to prune or train. Can I prune Baptisia? If you wish, you candeadhead to remove the old foliage and leggy plants can be trimmed lightly to force a flush of growth. Let’s learn when and how to prune Baptisia. Nobody goes out in nature and prunes plants, so it would stand to reason that native species are built to grow just fine without pruning. This is the case regarding false indigo pruning. Cutting back Baptisia is not necessary, but if you like to maintain a perfectly manicured landscape, there are three instances that it might be suitable to prune the plant. Baptisia will die back to the ground in most regions, so clean up pruning in fall is not necessary. After storms or rough games of “shirts and skins” in the backyard, a little trimming may be required to remove any damaged stems. You can choose to do this type of tidying up at any time of the year. Some gardeners prefer to cut the plant back before it dies down in fall but this isn’t obligatory and is just a cosmetic step. Another reason to trim Baptisia is to remove the seed heads. These are actually quite ornamental but the spent flowers and seed heads may pose a visual distraction so they can be snipped off. The third reason for cutting back Baptisia is to force young plants to produce fuller bushes. Light trimming will cause the plant to produce a flush of growth that is closer to the stems. The optimum time for cutting back Baptisia and most other perennials is in late winter. This is because the old stems and foliage act as protection for the plant, making a canopy over the tender root zone. Gardeners who hate to look at spent plants in their garden can certainly trim the plant back in fall when all the leaves have dropped. This will indicate that the plant has entered dormancy and it will not suffer from having most of its stems removed. In cooler climates, pile the leaves around the stems and let the plant persist until spring. The leaves caught in the stems will serve as a blanket for the roots. Prune away the old growth in late winter to spring. You can also choose to do nothing but the old growth will detract from the new leaves and stems to some degree. Use sharp, clean pruning shears and loppers any time you cut plant material. This encourages clean cuts and minimizes the transfer of plant disease. Cut at a slight angle just barely above new bud nodes. The angle should slant downward to force any moisture off the cut surface and away from the woody plant material. Baptisia can simply be trimmed to take off the old flowers and seedpods or you can take it nearly to the ground. 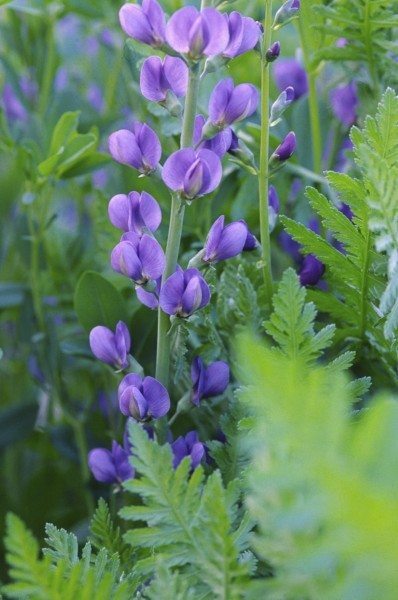 For rejuvenation false indigo pruning, cut the plant to within 6 inches of the ground in late winter to early spring. The plant will quickly grow to surpass its former height. One of the best things about Baptisia is that you really don’t even have to meddle with pruning it. New spring leaves will redecorate the plant and the intense lovely lavender blue flowers will run rampant among the old growth, hiding it and producing a floral attraction year after year without your intervention.